On this Thanksgiving Wednesday, I know none of you are thinking beyond the recipes that you're planning for tomorrow or the leftovers that you'll be eating for days afterward, so I am taking a different direction today. No dinner recipe today. 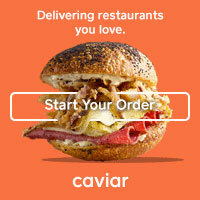 We're talking about restaurants today instead-- so someone else can take care of making dinner for you. And since you're probably sick of hearing about turkey too, let's talk about beef-- and there's no one that knows beef better than the new Wollensky's Grill. I recently had the opportunity to preview the menu at Wollensky's Grill and even as a foodie who prefers her meat white and lean, I really enjoyed the beef-centric menu here. You likely know of Smith & Wollensky, an upscale steakhouse with locations in a handful of major US cities. They are famous for serving up high quality steaks with traditional steakhouse sides in elegant classically American dining rooms. Well, the downstairs level of Chicago's Smith & Wollensky just got a lot more fun with the opening of Wollensky's Grill, the steakhouse's new gastropub concept. The menu has a focus on beef (what else) and is still made with top notch ingredients, but the plates are made for sharing and the atmosphere is a bit more laidback than its sister restaurant upstairs, though it still has that steakhouse feel and also an amazing location right on the Chicago River. & Oils, Mint, and Bocelli Prosecco. With fresh lemon juice and Prosecco-- two of my favorite cocktail ingredients-- I knew this one would be a winner and it was definitely a good one with just the right amount of sweet and tart. I also tried the "L" Car, a cocktail made up of Ginger-Infused Captain Morgan Spiced Rum, Solerno Blood Orange, Fresh Sour Mix, Cinnamon-Sugar Rim. 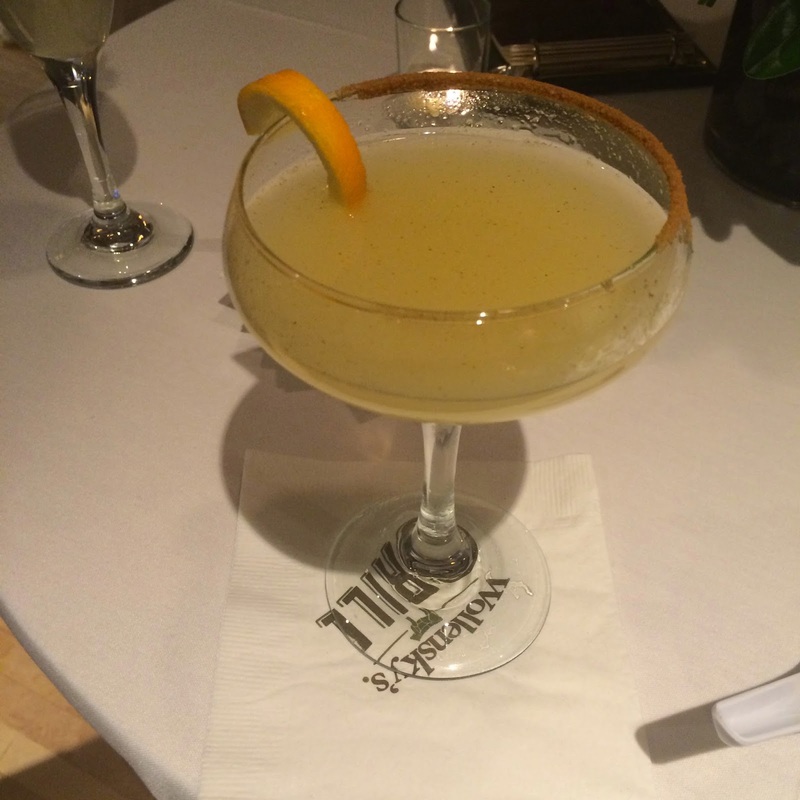 This cocktail was a bit on the sweeter side with a touch of sour and I absolutely loved the cinnamon-sugar rim. Photo courtesy of The Food Channel.com and Cory Dewald for Jeff Schear Visuals. On to the food, Wollensky's menu offers a playful take on steakhouse fare with many of the items plated for sharing. Their bread, butter & pickles plate, for example, is anything but typical. Pretzel bread sticks are served alongside a deliciously savory mustard butter. The housemade pickle selection includes thick sliced cucumbers, cauliflower, carrots, and red peppers and it is perfect for snacking. 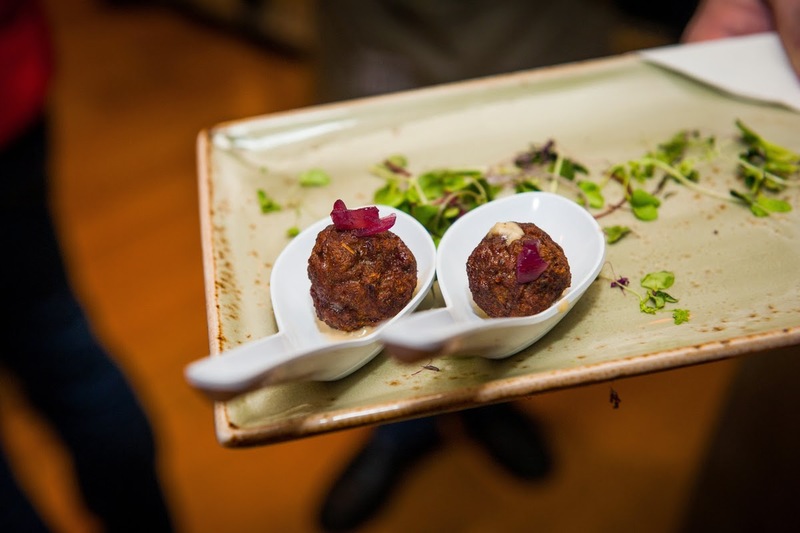 One of my favorite items of the night was a complete surprise to me: The prime beef meatballs. I'm not typically a huge meatball fan-- and certainly not one to order them when I see them on an appetizer menu-- but these were really delicious. Good quality beef was served with sweet onion marmalade and a bleu cheese fondue sauce. The flavors were intense, but worked together so well and the meatballs were moist and perfectly cooked. I made sure to grab one of these little spoons every time that tray came my way! Another sharable snack that topped my list at Wollensky's was the BBQ Beef Spring Roll. 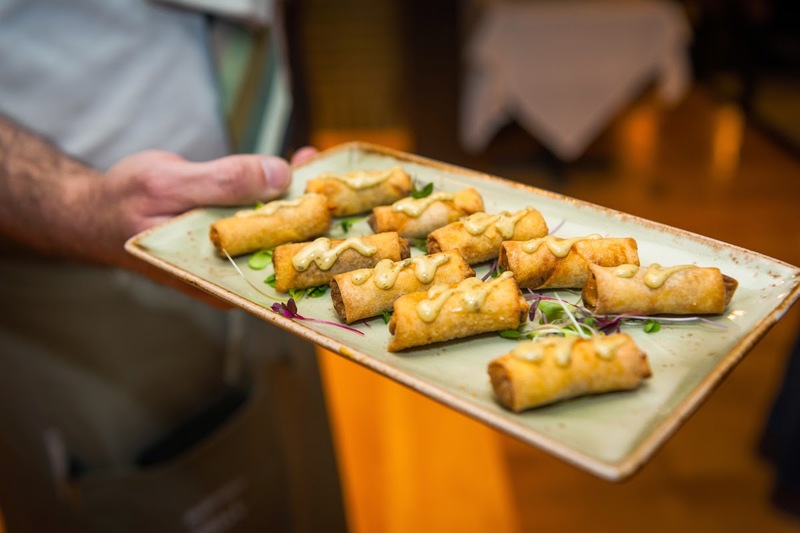 Wollensky's slow smoked prime beef and delicious BBQ sauce is wrapped up in a little spring roll wrapper, cooked until crispy, and served with a delicious slightly spicy green chile queso sauce. THe beef was fall apart tender and the sauces were seasoned really nicely. These are the perfect little bite for snacking on-- and a small bite that packs big flavor. 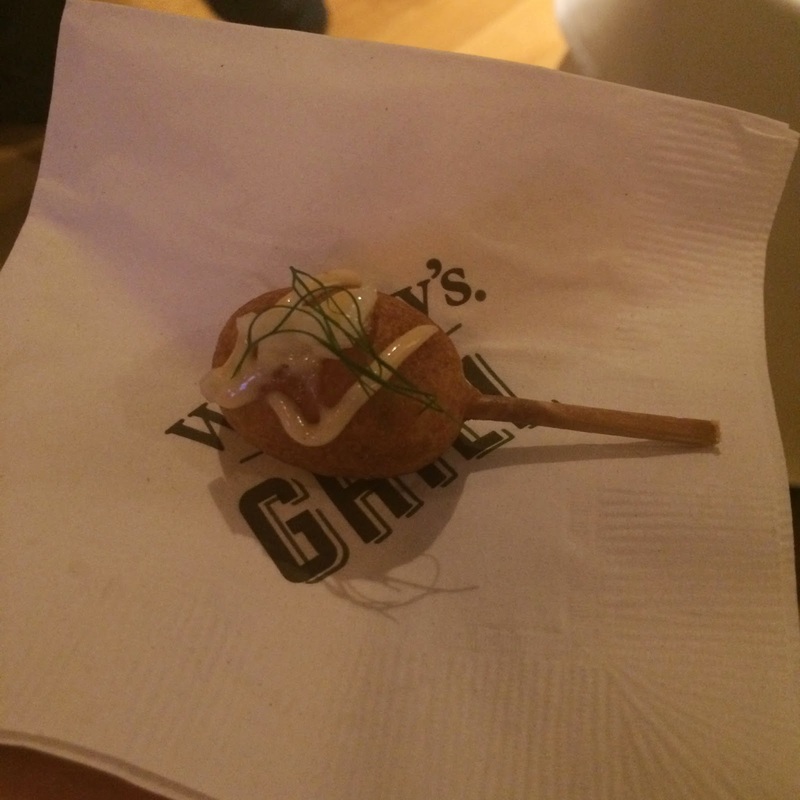 Some other can't miss bites of the night were the lobster corndogs, which everyone was really excited to try. Whole chunks of lobster are encased in a fluffy fried corn breading and topped with a super savory cognac mustard. 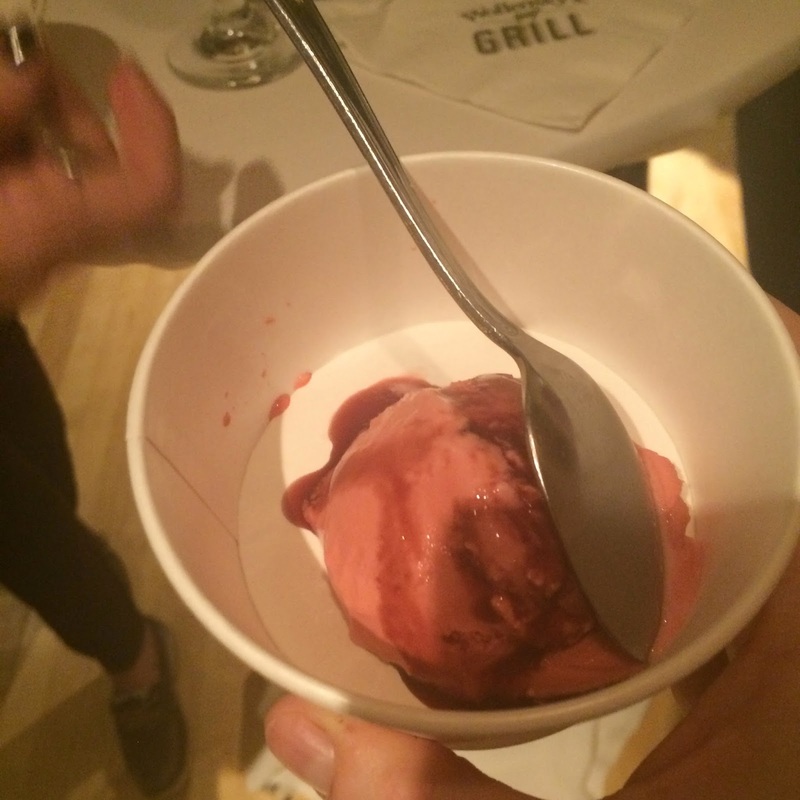 Also of note: a gelato made from Smith & Wollensky's house red wine. Unbelievably tasty! Photo courtesy ohttps://www.blogger.com/blogger.g?blogID=6144537172716721800#editor/target=post;postID=2060306944422789879;onPublishedMenu=allposts;onClosedMenu=allposts;postNum=1;src=linkf The Food Channel.com and Cory Dewald for Jeff Schear Visuals. And I saved the best for last here: Beef bacon. This is one of the signature items on the Wollensy's Grill menu and one that the executive chef told us took him months to perfect. 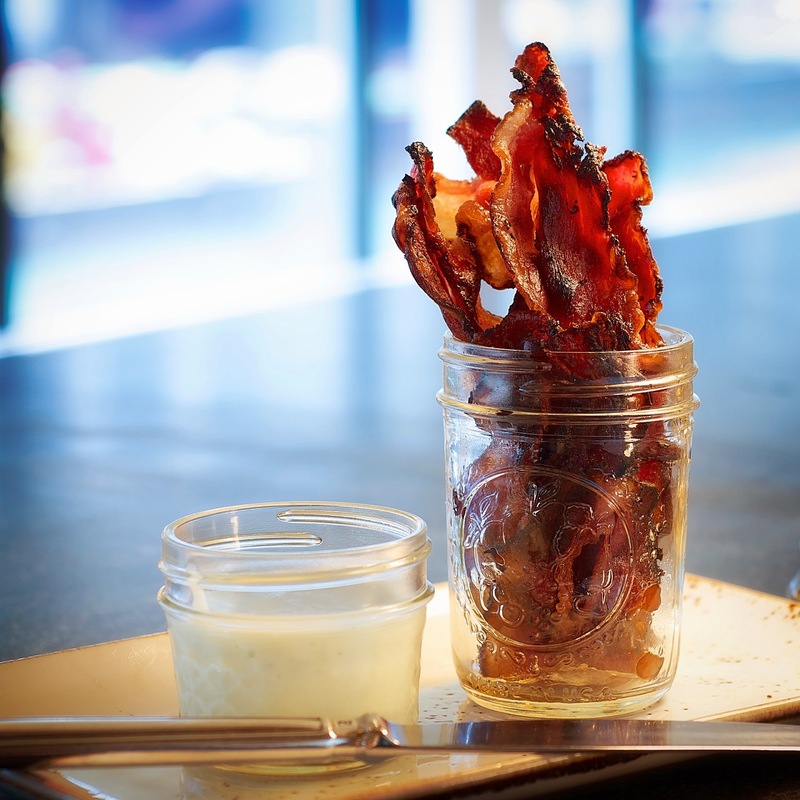 The Cop 'O Bacon includes a mason jar filled with crispy salty beef bacon smoked in house and paired with a rich bleu cheese dip. This bacon was leaner than pork bacon, but still had that great savory smoky flavor you crave from traditional bacon. Another great snack for sharing. 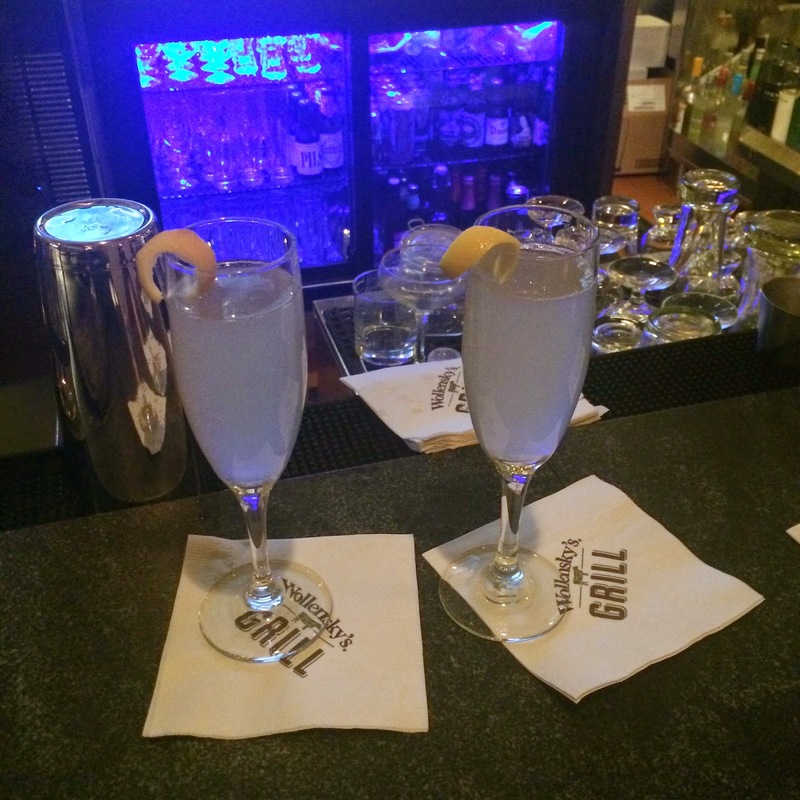 To sum it all up: I like to think you'd take your clients for a meal at Smith & Wollensky and then grab your coworkers and head to Wollensky's Grill for happy hour food and drinks. Either way, you're definitely in for a great meal! Editor's Note: My meal at Wollensky's was complimentary, however the opinions expressed in this post are my own.